Alternatives to amalgam include composite resin, glass ionomer, porcelain, and gold, among other options. Most consumers choose direct composite fillings because the white coloring matches the tooth better and the cost is considered moderate. Composite fillings have also been criticized because some of them contain the controversial material bisphenol-A (BPA). Dentists have a variety of opinions about the safety of BPA and other types of bisphenol, such as Bis-GMA and Bis-DMA. There has likewise been concern about glass ionomers, all of which contain fluoride. Patients who are concerned about the ingredients in their dental materials often choose to speak with their dentists about using a material that does not contain certain ingredients. For example, a product named Admira Fusion8/Admira Fusion X-tra9released in January 2016 by the dental company VOCO is reported to be ceramic10and not to contain Bis-GMA or BPA before or after it has been cured. 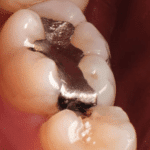 In addition to considering which material to use for dental fillings, it is essential that dental patients and professionals be familiar with and utilize safety measures when removing dental amalgam mercury fillings. 1. Laske Mark, Opdam Niek JM, Bronkhorst Ewald M, Braspenning Joze CC, Huysmans Marie-Charlotte D.N.J.M. Longevity of direct restorations in Dutch dental practices. Descriptive study out of a practice based research network. Journal of Dentistry. 2016. Abstract available from: http://dx.doi.org/10.1016/j.jdent.2016.01.002. Accessed January 12, 2016. 2. McCracken MS, Gordan VV, Litaker MS, Funkhouser E, Fellows JL, Shamp DG, Qvist V, Meral JS, Gilbert GH. A 24-month evaluation of amalgam and resin-based composite restorations: Findings from The National Dental Practice-Based Research Network. The Journal of the American Dental Association. 2013; 144(6):583-93. Available from: http://www.ncbi.nlm.nih.gov/pmc/articles/PMC3694730/. Accessed December 17, 2015. 3. Laccabue M, Ahlf RL, Simecek JW. Frequency of restoration replacement in posterior teeth for US Navy and Marine Corps personnel. Operative dentistry. 2014; 39(1):43-9. Abstract available from: http://www.jopdentonline.org/doi/abs/10.2341/12-406-C. Accessed December 17, 2015. 4. Pallesen U, van Dijken JW. A randomized controlled 30 years follow up of three conventional resin composites in Class II restorations. Dental Materials. 2015; 31(10):1232-44. Abstract available from: http://www.sciencedirect.com/science/article/pii/S0109564115003607. Accessed December 17, 2015. 5. Opdam NJ, van de Sande FH, Bronkhorst E, Cenci MS, Bottenberg P, Pallesen U, Gaengler P, Lindberg A, Huysmans MC, van Dijken JW. Longevity of Posterior Composite Restorations: A Systematic Review and Meta-analysis. Journal of Dental Research. 2014; 93(10):943-9. Available from: http://www.ncbi.nlm.nih.gov/pmc/articles/PMC4293707/. Accessed January 18, 2016. 6. Heintze SD, Rousson V. Clinical effectiveness of direct class II restorations—a meta-analysis. J Adhes Dent. 2012; 14(5):407-31. Available from: http://www.osteocom.net/osteocom/modules/Friend/images/heintze_13062.pdf. Accessed December 17, 2015. 7. Rodolpho PAD, Donassollo TA, Cenci MS, Loguércio AD, Moraes RR, Bronkhorst EM, Opdam NJ, Demarco FF. 22-Year clinical evaluation of the performance of two posterior composites with different filler characteristics. Dental Materials. 2011; 27(10):955-63. Available from: https://www.researchgate.net/profile/Rafael_Moraes6/publication/51496272.pdf. Accessed January 18, 2016. 8. See Admira Fusion on the VOCO website at http://www.voco.com/us/product/admira_fusion/index.html. Accessed January 18, 2016. 10. See Admira/Admira Fusion X-tra News on VOCO website at http://www.voco.com/en/company/news/Admira_Fusion-Admira_Fusion_x-tra/index.html. Accessed January 18, 2016. 11. Koral S. A practical guide to compatibility testing for dental materials. 2015. Available from the IAOMT Website. https://iaomt.wpengine.com/practical-guide-compatibility-testing-dental-materials/. Accessed December 17, 2015. 12. Biocomp Laboratories Website is http://www.biocomplabs.com/about.html. 13. Clifford Consulting and Research Website is http://www.ccrlab.com/. 14. Stejskal VD, Cederbrant K, Lindvall A, Forsbeck M. MELISA—an in vitro tool for the study of metal allergy. Toxicology in vitro. 1994; 8(5):991-1000. Available from: http://www.melisa.org/pdf/MELISA-1994.pdf. Accessed December 17, 2015. MELISA Web site is http://www.melisa.org/. Learn about steps that can be taken to protect patients, dentists, and environment during dental amalgam mercury removal.